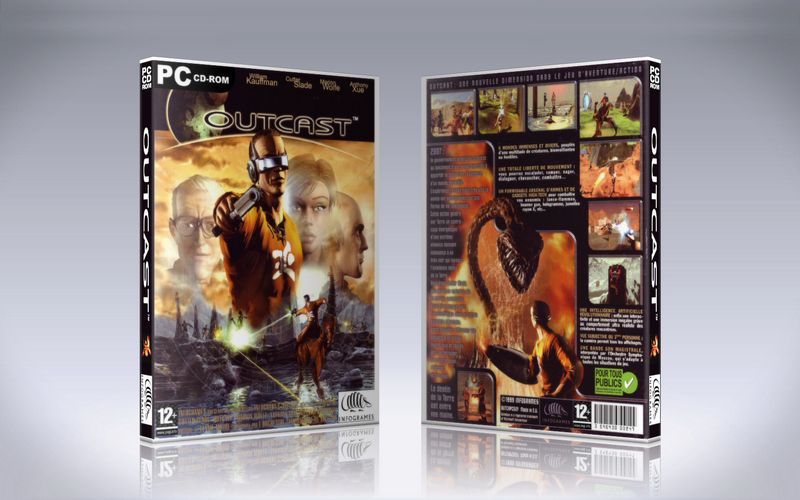 Outcast is an action-adventure video game developed by Belgian developer Appeal and released by Infogrames for Windows in 1999. The game was critically acclaimed, for instance it was named the “Adventure Game of the Year” by GameSpot in 1999. The player controls the protagonist Cutter Slade around the alien world of Adelpha in a third-person or first-person view, and only uses two mouse buttons; The right mouse button aims the player’s weapon, and the other is context-sensitive (For example, standing in front of an NPC makes the mouse button initiate conversation, while running around has the mouse button make Cutter jump). The player can walk, run, jump, crawl, and climb onto virtually any ledge Cutter can reach with a jump. Aside from the tutorial area, the player is free to move to any region of Adelpha as they please through the travel gates known as Daokas. The player can also acquire a Twon-Ha (a beast of burden that can be ridden), which makes traversing the vast regions much quicker, either by simply buying one or doing certain quests that reward the player with one. A large part of the game focuses on conversing with the friendly aliens known as the Talan in order to learn the story and history of Adelpha, and to progress in Cutter’s mission. While this can all be skipped, they treat the player differently depending on how the player treats them, through a reputation system; If the player perform many tasks to help them, they like them more and are more eager to help, whereas if the player does things that harm them they will become more and more angry with the player and aggressively dismiss them. There are multiple variations of dialogues which are selected either randomly or based on the player’s reputation. The enemy soldiers can be weakened by performing a certain task for the leader of each region. When this is done, they will stop producing resources for the soldiers: stopping food production lowers their health, stopping the mining operations makes their weapons less powerful, etc. A good reputation is necessary to convince the Talan to stop production of resources, so the player is encouraged to be good to the Talan. Outcast uses a unique way to save games, integrated with the game world. At the start of the game, the player receives an object called a “Gaamsaav”. He is instructed that the Gaamsaav is able to “capture his essence”, so that it may later be restored. To save a game, the player equips the Gaamsaav and “squeezes” it, making it glow and emit a sound. The sound can be heard by enemies and they will investigate, so that the player must take the situation into account before saving a game. After a few seconds, the game pauses and a save menu overlay appears.